Liberals have been calling for the new Democratic House to file articles of impeachment against Donald Trump ever since winning the House in the Nov. 8 election in 2016, but there has been this obstacle: Nobody believes that Republicans who control the Senate will allow a House impeachment to move to a trial in the Upper House of Congress, much less contribute the needed two-thirds of the vote to convict and remove him from office. But now Trump may be handing both the House Democrats and Republicans frustrated with Trump’s madness the issue that could go all the way: the President’s stated intent to bypass Congress with its Constitution-enshrined power of the purse by declaring a “national emergency” so he can build his wall along the whole Mexican border on his own dubious authority as Major Domo. Here’s the problem for Trump aka the MF. As “national emergencies” go, illegal immigration across the border from Mexico just doesn’t cut it. Trump can claim, as he has been doing since he began campaigning for President in 2016, that “rapists, murderers, gangs and drug dealers” are “pouring across” the unguarded border with Mexico, not to mention hordes of illegals stealing jobs from Americans, but it just ain’t the reality. 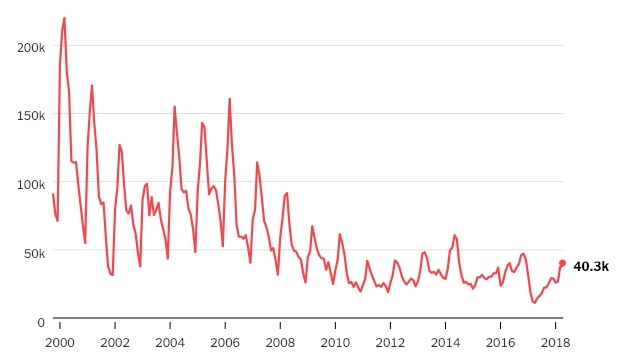 That trend line certainly doesn’t look like a national emergency type of crisis does it? As for Trump’s claim that criminals and drugs are pouring across the “open” border with Mexico, the reality is that most “illegal” immigrants in the US are people who got into the country legally, for instance on student or tourist visas, and who then decided to stay on when they expired. Meanwhile most of the drugs coming into the country are sneaked in through official entry points at harbors, airports and border crossing points at the Mexican and Canadian borders or at airports and harbors, not smuggled across open areas of the border with Mexico, where such smuggling is much easier to spot using motion detectors and aerial monitoring. There simply is no “national emergency” on the Mexican border. If Trump were allowed to declare one for this ridiculous reason in order to unconstitutionally appropriate over $5 billion of taxpayer money to build an unneeded wall that local Americans along the border don’t want, that the majority of Americans don’t want, and that would do serious environmental and economic damage, not to mention damage to the bedrock principle of Constitutional government and the power of Congress to approve all government spending, it would likely cause a rebellion in Congress, not just by Democrats, but by genuine conservatives in the Republican Party. And while building the stupid wall might be cheered by the white yahoos who believe Trump’s inane and offensive White Nationalist rhetoric about stanching the supposed flood of brown people from Mexico, the truth is that America is growing increasingly brown and multi-racial not because of illegal immigration but thanks to higher birth rates among black and brown US citizens living here than among white Americans. And that is a demographic trend that will continue whether or not a few hundred thousand immigrants a year keep slipping into the US. It’s a demographic trend that, immigration or no immigration, insures that white people will become a minority of the US population in another two decades (as they already are in California which is now 38% non-Hispanic white and seems to be doing just fine, thank you. The declaring of a false “national emergency” based upon patent falsehoods is an impeachable crime against the Constitution that not only should become an impeachment article in the House, but that should win a conviction in the Senate as the evidence gets presented at first a House Impeachment Panel hearing and second at a Senate Impeachment Trial. The thing is, this president has lied so routinely that we tend to forget that some lies have consequences, and here is one that clearly does. This is a lie, moreover, that can be easily and demonstrably shown to be a lie. Any way you look at it, there is simply no nationable emergency at the country’s southern border, and thus no need for a Trump Wall on the Mexican border. So if Trump does declare a national emergency at the border, as he seems to be getting ready to do, and starts paying for it without Congressional approval of the funds, let’s impeach this racist Mofu!